In South Carolina, 194,000 uninsured residents fall into the health insurance coverage gap and are unable to enroll in Medicaid or get tax credits to help buy coverage in the new marketplace. These South Carolinians fall below 100 percent of the federal poverty level guidelines ($20,090 for a family of three and $11,770 for an individual), but make too much to qualify for Medicaid, and make too little to qualify for tax subsidies to buy insurance through the marketplace. To understand the health insurance coverage gap and why we support accepting federal funds to help close the gap, it is important to know some basics about the Medicaid program. Medicaid was introduced in 1965 under President Lyndon B. Johnson in attempt to extend access to quality health insurance coverage to low-income Americans. Medicaid is administered individually by each state. Though Medicaid does provide quality health insurance to many, only certain groups of very low-income people are able to enroll in the program. In order to be eligible for Medicaid, a person must fit into one of these eligibility groups (children, pregnant women, some very low-income parents, seniors, and people with disabilities) and have very low income. Non-disabled/non-elderly adults without children are ineligible for Medicaid coverage regardless of their income level as well as parents who are above 62% of the federal poverty level. Currently, thousands of low-income adults, most of them working, are ineligible for Medicaid coverage because they do not fit into one of these eligibility groups. 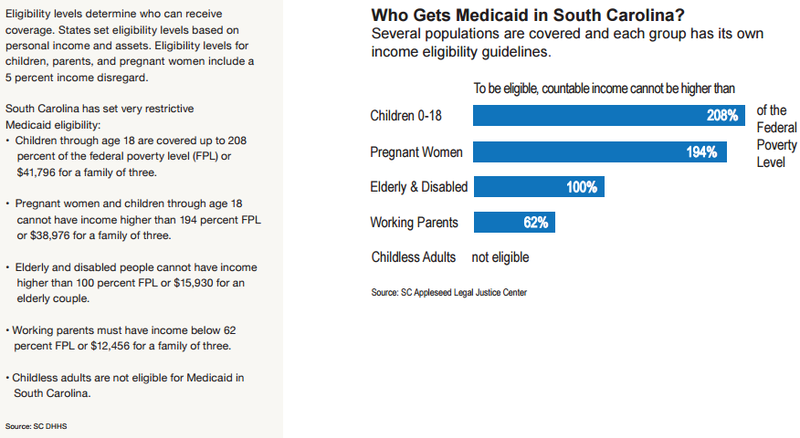 The following graphic illustrates who gets Medicaid in South Carolina. Those who are not eligible for Medicaid are mostly adults without children or working families with children. These people make up what is called the Health Insurance Coverage Gap. SC Appleseed, along with other non-profits, statewide associations, business leaders, a chamber of commerce, and individuals who are concerned about the future of healthcare in South Carolina formed the “Close the Gap SC” coalition. We support a plan that extends health care coverage to the more than 194,000 South Carolinians through the use of existing federal funds our state has failed to drawn down and use. To find out how you can be a part of this positive effort visit Close The Gap SC! The South Carolina Medicaid Chartbook! The South Carolina Chartbook was joint effort by SC Appleseed and Close the Gap SC. We want to thank The Commonwealth Institute for Fiscal Analysis for their assistance and leadership with this effort.